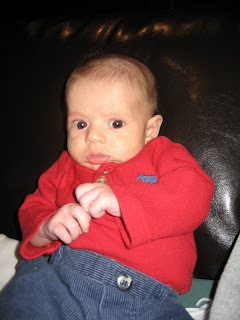 Maddux has had colic since he was about two weeks old. I've heard that it's a stage that they eventually they grow out of it...I hope it's true! At times its not that bad but there are days where I swear he has an upset stomach for the whole day! Last night and today has been one of those days. Since about 11 o'clock last night he has been crying a lot! He will occasionally fall asleep for only an hour and a half at a time and then wakes up crying again...it's so sad and so tiring! There are a few tricks that have been passed down to me by my sister Olivia who's daughter also had colic and by my Mom. They are the only things that keep me somewhat sane...so I thought I would pass them along. First is the Yoga Ball...I know it seems strange but you sit on it and bounce with the baby on your lap and I don't know why but it calms them down. This is an easy thing you can do and it gives you a much needed break from the screaming! 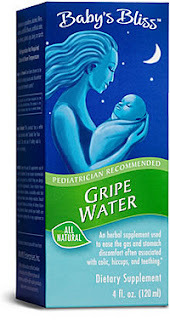 Another trick is "Baby Bliss Gripe Water" it is a miracle worker! It's a natural herbal water that you give them when they have a stomach ache and within minutes of giving it to them they calm down, start getting all their bubbles up, and usually fall asleep. It is amazing stuff! You can't get it in a lot of places so I have to order it off the Internet... but it is worth all the trouble. We don't leave the house without it! The last trick is a tip from my Mom. 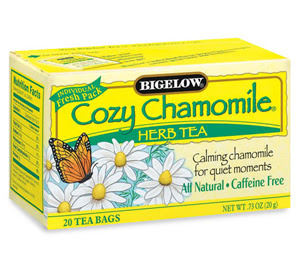 She recommends feeding them herbal tea...either peppermint or chamomile flavored. It seems strange but it works. The warmth of the liquid calms them down and it also helps them get bubbles up. They won't drink a lot but even just a sip can help. They will usually fall asleep after drinking it... and it's good to know that after they wake up they will be starving! 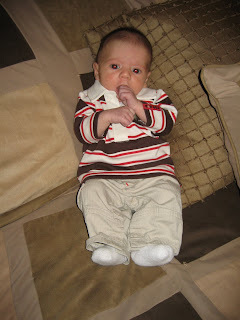 Good thing Maddux is such a cute little guy because it can be so frustrating at times. 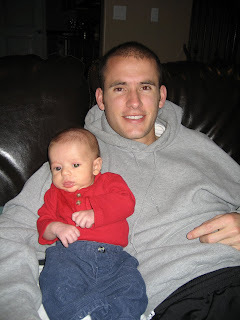 I am thankful to have Greg around too because he is always willing to take a turn holding him when he's upset! Let's hope this stage is over soon! I have always wanted to be a mom. 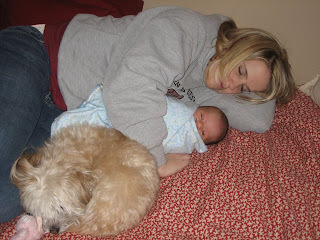 I was so excited when I got pregnant because I was starting a stage of my life that I had always looked forward to.... but, I had no idea just how neat it was going to be. Maddux will turn two months old in two days and it really has been two of the funnest, scariest, and most rewarding months of my life! At first I couldn't believe he was ours and I felt like I had no idea what I was doing but now it seems weird to think of our family without him. He has brought so much love and joy to our home. Some of my favorite times I spend with him are in the mornings. 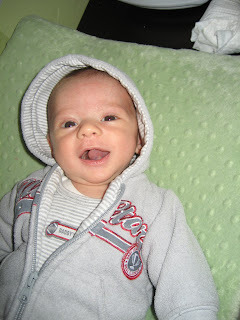 He is always so happy when he wakes up so you'll notice that in alot of my picures of him smiling he's wearing his p.j.'s. 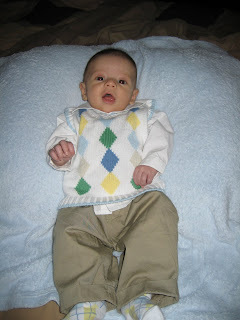 Here are a couple of pictures of him in his new Sunday clothes. 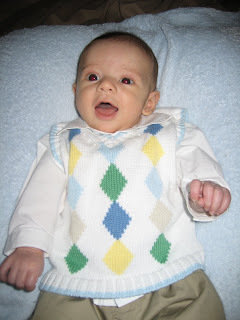 He looked so handsome and grown up in the little slacks and vest. I am sad to say that I only have 4 weeks left of my 12 that I took off of work to spend with Maddux. I feel so blessed and grateful that I was able to have so much time with him but I am very emotional about the thought of leaving him. I can't even say it without crying. It's going to be very difficult for all three of us. I know we will survive... but I am dreading it! Maddux is getting so big and is so much fun to hang out with. 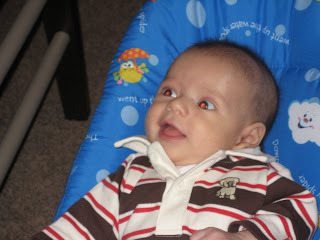 The more responsive he gets makes him seem like a little boy and not a newborn anymore. He has started to love being read to and sung to. He smiles a lot and tries to talk to you when you talk to him. We just can't get enough of him. Here are a few new picture of him and things that we have been up to. This is just an adorable smiling picture Greg took of Maddux in his new shirt that Grandma Harris sent him for Valentine's Day! 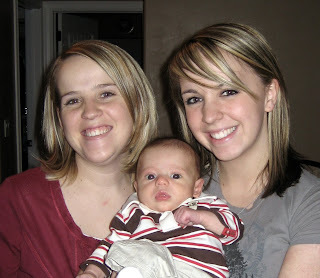 Aunt Deidre came to see Maddux on her way to Las Vegas for the three day weekend. 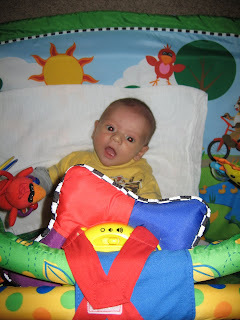 This is one of Maddux's favorite things these days...it's a Baby Einstein mat with lights and toys that hang down. He lays on it and smiles and kicks his legs...he loves it! Last weekend Maddux started smiling every once in a while and we were so excited...but the smiles wouldn't come that often so we could never catch one on camera. 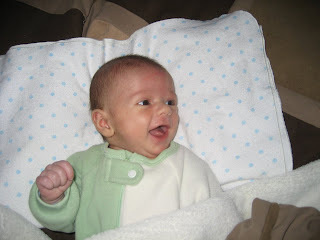 Well, it's been a week now and he has started smiling more and more. 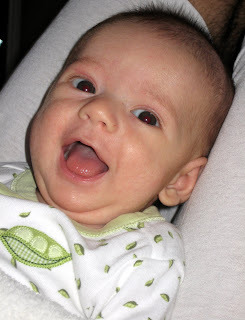 This morning right when he woke up he was so smiley...so I grabbed the camera and got this super cute picture of him! I tried again later to capture another one and I was sucsessful yet again! I know I probably totally seem like a typical first time Mom because I am so excited about a smile... but it is so fun to have him look right at you and give you a big grin! Although we were thrilled about all the smiles from Maddux...we had a rough weekend. Greg ended up getting food poisoning on Thursday night from Chili's and so he spent the whole night and morning throwing up. Maddux also had a little upset tummy that night and didn't sleep for longer than 1-2 hours at a time so I was pretty much up all night too. It was crazy! Greg thankfully was able to call in sick to work on Friday and then we spent the rest of the weekend trying to catch up on sleep and get Greg feeling better. Me, Maddux, and Boca fell asleep on the bed in the guest room. We were exhausted! I couldn't be more thankful this weekend is over!